Saturday 6th June saw the first episode of The Voice India. As many of you are aware, The Voice, is already an extremely popular international singing reality show concept. The Voice has now arrived in India and has the multi talented Himesh Reshammiya (HR), Shaan, Mika Singh and Sunidhi Chauhan as its ‘fabulous four’ coaches. The show is hosted by popular television actor Karan Tacker. Two of the coaches are also seen in their new looks: our favourite coach HR, wears golden shoes, and has a statement tattoo on his arm to show off his new lean look. While coach Sunidhi looks incredibly chic with her short hairstyle and trendy outfit. The Voice India is split into three rounds: Blind auditions, Battle rounds and Live rounds. Saturday’s show opened with short introductions by the coaches, followed by their spectacular performances. Their opening acts were choreographed by Terence Lewis. Sunidhi Chauhan performed to her superhit song ‘Aa Zara’ from Murder 2 and ‘Kamli’ from Dhoom 3. Shaan performed to ‘Char Kadam’ from PK, ‘Dil Leke Darde Dil’ from Wanted, and ‘I Love You’ from Bodyguard. Mika Singh performed to his hits ‘Jugni’ and ‘Party Toh Banti Hai’. Last but not the least, our favourite HR, came as Ravi Kumar (from his superhit film The Xpose) and performed a sizzling act to his song Catch Me If You Can. Then all four judges danced and sang HRs song ‘Desi Beat’ from Bodyguard together. It was then time to begin the Blind auditions. Just to reiterate, blind auditions mean that when the contestant walks on stage, the coaches are facing the audience, with their back to the contestant. This means that they are not allowed to pre judge the contestant by their looks or attitude. They only see the contestant when they hit the buzzer in approval of their voice, as that is when their chair automatically turn around. The first contestant was Sargam, who is from Luidhiana in Punjab. She also performs with her own music band and she sang ‘Tere Bina’ from Crook. Coach HR was the first to hit the buzzer followed by Mika and Sunidhi. Coach Shaan did not press the buzzer. After many comic bribery attempts to coax Sargam into their team, she eventually chose coach Sunidhi. Sargam is the first member of Team Sunidhi. The second contestant was Sahil Solanki who is also from Punjab. He sang ‘Tashan Main’ from Tashan. Mika was the first to hit the buzzer, followed by Sunidhi and Shaan. Coach HR did not hit the buzzer. Again after much comic bribery from the coaches (this is the most funniest part of the show!) Sahil chose Mika. Sahil is the first member of Team Mika. The third contestant was Kushal Chokshi from Ahmedabad, Gujarat. Kushal sang a song called ‘Mere Naina’. Coach HR was the first to hit the buzzer, followed by Mika and Shaan. Coach Sunidhi did not hit the buzzer this time. Kushal chose to be in Team Himesh and coach HR was very happy to have Kushal in his team. HR said, from his own experience, technicalities are most important when singing and he will do his best to pass on his own experience to Kushal. The fourth contestant was Shaheen Khan from Mumbai. She was unfortunately very nervous whilst singing Lambi Judaai from Hero. The judges as expected, did not press the buzzer but they acknowledged her nervousness and told her that she needs to overcome it in order to succeed. Coach Sunidhi went to comfort Shaheen and as Shaheen left the stage, coach HR asked the production team for her number as he felt she had an amazing tonal quality and he would give her a chance to sing in his films. The fifth contestant was Amrapali. She sang a jazzed up version of the retro classic Aage Bhi Jaane Na Tu. Sunidhi was the first to hit the buzzer followed by Shaan. Mika and HR did not hit the buzzer. Amrapali chose Shaan and became the first contestant to enter Team Shaan. The sixth contestant was Rishabh Chatruvedi and he sang the ever popular reality show favourite difficulut song ‘Saanwre’. The audience learnt that Rishabh loves to ‘flirt’ and already has a huge crush on coach Sunidhi. Coach HR was the first to hit the buzzer followed by coach Mika, coach Shaan and lastly coach Sunidhi. All the coaches sang comic songs to coax Rishabh into their team, but of course, Rishabh chose coach Sunidhi! After an exciting first episode, the second episode of The Voice India, opened with a recap of Saturday’s highlights. Coach Shaan spoke to his own “camera” to give the audience an insight into the coaches current state of mind. The first contestant of the second episode was Sanjana Bhola from Punjab. She has a religious/folk singing background and she performed to a folk song. Coach Mika was the first to hit the buzzer followed by coaches HR and Sunidhi. Coach Shaan did not press the buzzer. Coach HR told Sanjana that she has a lot of divinity in her voice. Coach Mika said that through his NGO, he would offer to bear Sanjana’s expenses for the rest of her life regardless of whose team she went into. Now this really is a noble gesture from Mika Singh! After a countdown from coach HR, Sanjana chose Team Himesh! The second contestant was Anshuman Pol from Assam. Anshuman is a music teacher and has a dream of opening a music school. Anshuman sang Sajda from My Name is Khan. Coaches Shaan and Sunidhi pressed the buzzer and Anshuman chose to be in Team Sunidhi. The third contestant was Piyush Ambhore from New Delhi. Piyush sang Khalbhali from Rang De Basanti. Coach HR was the only one to press the buzzer. Whilst he agreed that Piyush could have sung much better, he also said that he knows Piyush can perform really well for him. Piyush became part of Team Himesh. The fourth contestant was Shristi Bhandari. She sang Jiya Lage Naa from Talaash. Coach Shaan hit the buzzer first followed by coaches HR, Sunidhi and Mika. Coach Mika said that Shristi sang a difficult song very well. The coaches continued to coax Shristi into their respective teams and after coach HR’s rapid countdown Shristi chose to be in Team Sunidhi. The fifth contestant was Varsha Krishnan. Coaches Mika and Shaan buzzed first. Coaches Sunidhi and HR did not press the buzzer. Varsha chose to be in Team Shaan. The sixth contestant was Kabul Bukhari and he sang Haal E Dil from Murder 2. The coaches were sadly not impressed by Kabul and felt that he did not match the current standard of chosen singers. Before the last contestant, the fabulous four coaches took a Selfie together! The seventh contestant was Tanu Srivastava. She sang the classical Aan Milo Sajana. Coach Mika hit the buzzer first followed by coach Sunidhi. Tanu chose to be in Team Mika. 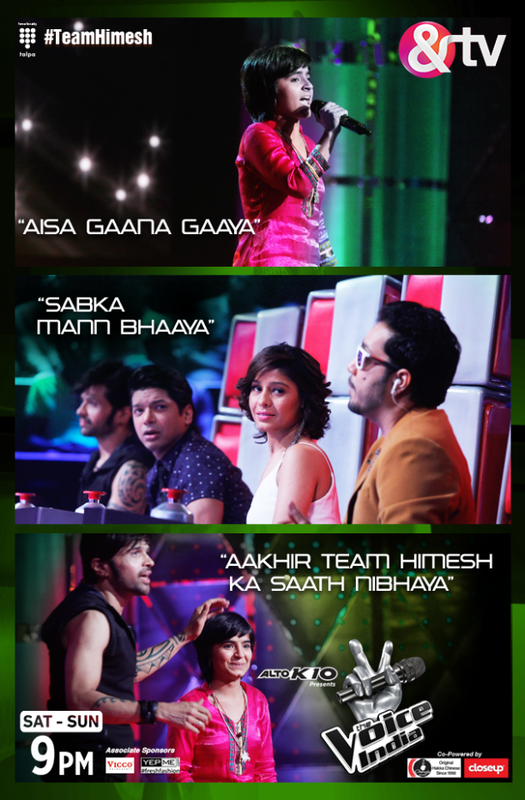 It was certainly an exciting first week of the voice india! Stay tuned with BollySpice for more updates of your favourite new musical reality show!